American Express Travel has launched a new cashback credit promotion. There are a couple of versions. The most generous, which I got, is a whopping £200 back on a £600 spend via Amex Travel. The other version, which my wife has, offers £50 back on £200 of spend. Only 14,000 people can register for the £600 version so I recommend looking at the ‘Offers’ tab on your Amex online statement pages and signing up, if it is there. The ‘£50 back on £200’ version is capped at 40,000 people. The offer is more likely to show on a Gold or Platinum card than on a British Airways or SPG American Express card. You have until 28th February to do the necessary spend. Historically these offers have been based on cumulative spend although it is not specified here. This offer is only valid for pre-paid products. It is best used for a flight. Whilst there is clearly value in booking hotels this way too, Amex Travel is counted as a third party booking site and you won’t receive hotel points or status benefits. You can’t use it for Fine Hotels & Resorts bookings as these are not pre-paid. The rumours we reported a couple of weeks ago were true. 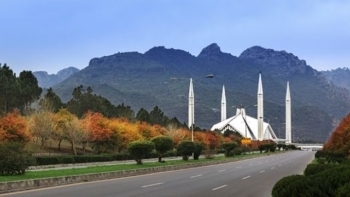 British Airways is resuming flights to Islamabad in Pakistan after a ten year absence. The original service was suspended following the bombing of the Marriott Hotel, the main international hotel in the city, in 2008 which killed 54 people. There will be three flights per week, departing Heathrow Terminal 5 on Tuesday, Thursday and Sunday. The first flight is 2nd June 2019. The aircraft will be a Boeing 787-8 Dreamliner with a three-class configuration. Avios seats are also available and bookable. If you have a child at school or sixth form college (not university), British Airways is currently accepting applications for its Summer 2019 work experience scheme. Positions are available at Heathrow (customer facing, operations, engineering, Waterside HQ), Gatwick (customer facing and engineering), Glasgow (engineering) and Cardiff (engineering). There is also a gliding scholarship in High Wycombe available. There were 600 roles offered in 2018 and BA is promising to increase the number in 2019 as part of its 100th birthday celebrations. Each placement lasts for five days and will require a week off school. You can find out more on the British Airways careers website here. The deadline to apply is Friday. My brother and his wife had an eligible flight cancelled yesterday morning by email, for a flight that same evening. They were given new flights the following day, around 12 hours later but they were no good in terms of their schedule. Short flight, so I think 250eur.. but how do I help them find the reason the flight was cancelled? Just ask the airline? Or another way? Doesn’t matter. It is up to the airline, if they refuse to pay, to provide proof of an acceptable reason for cancellation – and very few reasons, except weather, are acceptable. OT: Received a new Lloyds Avios Amex card today as my old one expires 1/19. I had assumed they would just close it then as it’s being axed. Any ideas on what the timescale for closure is? If you signed up to hotel status this year (2018), is there anything I can do come 2019 to extend my hotel status length? Can I assume if the cash back deal did not show up in my offers today, it is not going to? Not always a correct assumption. Has it been a case that some people get the same offers few days later? With other offers, definitely yes. I haven’t specifically tracked this one but probably same principle. Ie Amex want to release it to (say) 10,000 people. If, after some days, only 5,000 people have saved it, they’ll release it more widely to make the number. Anyone know if it should be done in one single transaction?